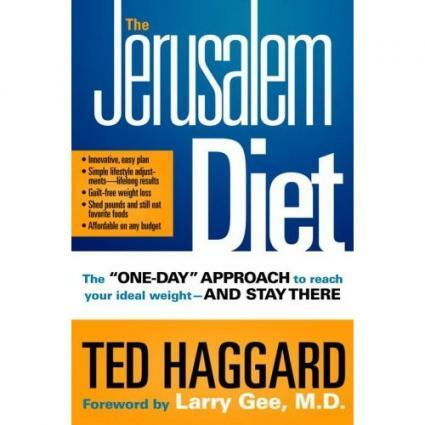 If you are looking for a simple, no-stress formula for losing weight and improving your overall health, Ted Haggard's book The Jerusalem Diet may be the answer for you. With its realistic weekly weight loss goal and daily weigh-ins, when you follow this diet plan you work toward your goal weight at a slow and gradual pace. To follow the program properly, you must commit to only two things: weighing in once daily at a fixed time, and losing one pound a week. The only items you need to buy for the Jerusalem Diet is a good, reliable, digital scale and a calendar. Mark the day you begin your diet with your starting weight, and then mark each successive week with a target weight that is one pound less than the target for the previous week, until you have reached your desired weight. There are two kinds of days on the Jerusalem Diet: normal days and "fat days." On normal days, you can eat and drink whatever you like, and you are not required to exercise. On fat days, you eat only fruits, nuts, vegetables, and seeds, drink only water, and exercise for one hour. What you weigh on a given day determines what kind of day it is. If you are over your target weight for the week, it's a fat day. If you are at or below your target weight, it's a normal day. This plan is based on the premise that it is easier to focus on weight loss one day at a time, and that small, "temporary" changes to one's lifestyle will eventually become habitual behaviors. Haggard states that the weight loss program is easily adapted to any other weight loss plan that you may wish to follow, and he encourages his readers to try the others to see how they may affect their bodies. There are many benefits to this approach. Self-acceptance is key, as is the concept of making lifestyle changes slowly and gradually. Being gentle, reasonable, and patient with one's body is encouraged -- and will no doubt be easier the longer one sticks with the plan. Dealing with failures in a healthy manner is important, as is being flexible when situations come up that would require you to "break" your diet (such as an important business lunch on a fat day). Fasting: A one- to three-day fast every three or four months may be beneficial, both physically and spiritually. Juicing: Using a juicer or blender, a person can make delicious, nutritious juices that can enhance health and improve the dieting experience. Superfoods: There are some foods that are so packed with nutrition and healthful nutrients that they should be considered "preferred foods" in the diet. Massage therapy: Useful for eliminating stress and releasing toxins. Organic eating: Organics are encouraged, but they are not required. Because organic foods are frequently more costly than their conventionally-grown counterparts, Haggard merely encourages dieters to eat produce -- without worrying unduly about how it was grown. The Jerusalem Diet is a simple, do-able program for gradual weight loss. It would work well for those who find it difficult to remain focused on long-term weight loss goals, or for those who are discouraged by how far they are from their ideal weight. Focusing on "one pound a week" is far easier, psychologically, than focusing on "I need to lose 50 pounds." While the nutrition may be questionable, with the "eat what you want" normal days, Haggard insists that the small changes in lifestyle will eventually add up to wiser eating choices overall.